The companions of De Grey and Ripon Chapter No 1356 held their installation convocation at Woolton Golf Club and on this occasion the chapter was honoured by the presence of the Chairman of Ormskirk and Bootle Group Frank Umbers. Pictured from left to right, are: The three principals, Albert Hogg, Matthew Wilson and Stephen White. The meeting commenced with first principal Matthew Wilson opening the convocation, assisted by Albert Hogg second principal and Philip Birch third principal. Once the initial business had been completed, director of ceremonies Peter Dodd left the temple and on his return announced that the representative of the Grand Superintendent Tony Harrison was without and seeks admission. Matthew Wilson answered that the companions would be delighted to receive him. Frank entered the temple, accompanied by grand officers Roy Pyne, John Lee, Woolton Group Vice Chairman Mike Cunliffe and acting Provincial grand officers Stephen Riley, John Roxburgh, John Goodrum, Ian Lynch, Michael Silver and John Wootton. The three principles arose and extended a very warm welcome to Frank, following which the ceremony of installation commenced. 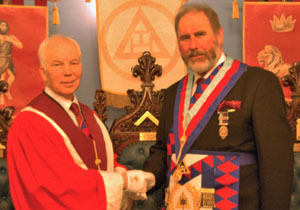 Third principal elect Stephen White was presented by Reg Moss and installed in full form, while second and first principals Albert Hogg and Mathew Wilson reaffirmed their obligations and proclaimed second and first principal correspondingly, after which the three principals invested their officers for the ensuing year. Matthew Wilson (left) and Frank Umbers. The ceremony was under the expert direction of the chapter DC Peter Dodd. The scripture reading to the third principal was by Mike Cunliffe. 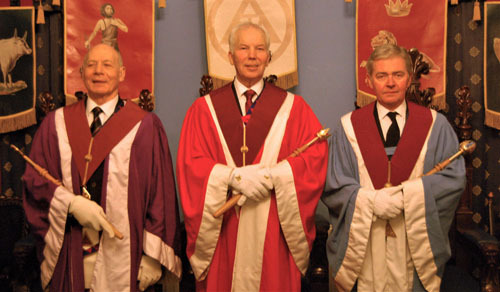 The robe addresses were performed to a high standard by Graham Fairley (scarlet robe), Mathew Wilson (purple robe) and Albert Hogg (blue robe). After the appointment of their officers, the address to the principals was given by Reg Moss, the address to the officers by Henry France and that to the companions by Roy Pyne, all delivered in an excellent manner. On the conclusion of the ceremony, Frank communicated the best wishes of the Grand Superintendent Tony Harrison to the three principals. Frank also congratulated the three principals and companions for a warm and sincere ceremony. Frank was then presented with a cheque for £300 on behalf of the chapter to the MCF 2021 Festival. Frank thanked the companions on behalf of the recipients for their generosity. The business of the chapter being completed, the chapter was then closed. The installation meeting was followed by an excellent festive board and in response to the toast to the grand officers, Frank expressed his own personal greetings to all present. Frank then promoted the MCF 2021 Festival and was pleased to see a number of companions wearing festival jewels. Continuing, Frank urged the companions to ask the brethren in their Craft lodges who are not already members, to consider taking the next step in Freemasonry and becoming a Royal Arch companion. Frank had a special mention for companion Graham Fairley who had sincerely and confidently delivered the scarlet robe address. Frank thanked the grand officer’s, the group vice chairman and the acting officers for attending as well as Bill Carter for his communications and support. A raffle was held at the festive board which raised £126 for charity. On conclusion of the evening, Frank was given a bouquet of flowers for his wife and a bottle of his favourite tipple by first principal Mathew Wilson. The final toast of the evening was in the hands of the janitor Tom Lunt. Pictured from left to right, are: Ian Lynch, Roy Pyne, John Roxburugh, Mike Cunliffe, Albert Hogg, Mathew Wilson, Stephen White, Frank Umbers, John Goodrum, John Wootton and John Lee.